India @ 70: Does forced philanthropy work? 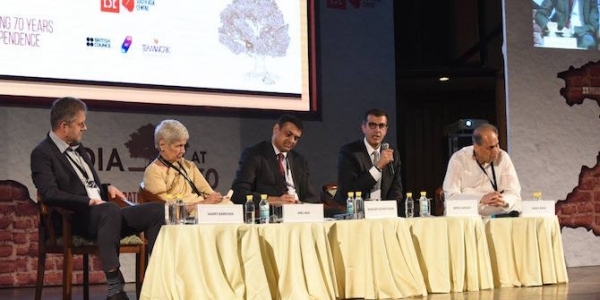 The first session of India @ 70: LSE India Summit 2017, presented by Apollo Tyres ltd, saw a confluence of corporate champions and civic campaigners consider contrasting courses for the conduct of corporate social responsibility (CSR) in India. Harish Alagappa reviews the first panel of the summit. Clause 135 of the Companies Act of 2013 directs companies that generate annual revenues above Rs.10 billion (approximately £ 120 million) to institute a Corporate Social Responsibility Committee that should consist of at least three directors and further mandates a minimum spend of 2% of their annual profits on Corporate Social Responsibility (CSR) activities. The panel at opening session of the LSE India Summit 2017 featured distinguished businesspeople that have an extensive background in the social development sector and came from companies that historically have spent far more than 2% of their profits on charitable causes. CSR Panellists at India @ 70: LSE India Summit 2017. From left: Harry Barkema, Anu Aga, Mukund Govind Rajan, Neeraj Kumar, Rahul Bajaj. Chief Ethics Officer and Spokesperson for the Tata Group, Mukund Govind Rajan, took a more optimistic view of the act. ‘The fact that eligible companies now have to include an independent Director of the CSR committee means that CSR has entered the boardroom.’ Describing this Tata Group’s history of philanthropic gestures, Rajan spoke of Jamshedji Tata’s ethos, ‘If the community is not successful, the business is not successful.’ He did strike a note of caution against loopholes in the act that can be abused and urged the government to be more proactive about ensuring corporations are staying true to the ideals of CSR. Rajan further suggested Indian corporations have their CSR teams trained to ensure better and more efficient activities, urging for a focus on mitigating the threats of climate change. India @ 70: LSE India Summit 2017 ran from 29-31 March 2017. Videos of all panels are available on our Facebook, and video and podcast interviews with panellists will be available on the South Asia Centre website soon. Harish Alagappa is a writer signed with the Asia Literary Agency and is currently working on his first book. He was formerly an Assistant Editor with the New Delhi-based think tank, TERI (The Energy and Resources Institute), and has written for The Times of India, The Encyclopedia of Energy, The Score Magazine, and Sportskeeda. In his spare time, he’s an amateur stand-up comic, quiz enthusiast, and Radiohead aficionado. He tweets @chaosverse. April 1st, 2017|Economy, Education, Environment, Events, Featured, LSE|Comments Off on India @ 70: Does forced philanthropy work?